Have tried to burn MP4 to DVD with Windows DVD Maker but failed to do that? That’s probably because MP4 video format is not in the supported video list of this Windows default DVD burning tool. To burn MP4 video files to DVD on Windows-based computer, you can download and install K-lite Codec Pack in your PC to enable Windows DVD Maker to decode MP4 format successfully. You can also take advantage of some other excellent DVD burning programs like Aimersoft DVD Creator to burn MP4 videos to DVD, which is another way to burn DVD in Windows (Windows 8) with ease. Read on to learn more about these two methods in details. Aimersoft DVD Creator is highly recommended for you to burn DVD. It is an easy-to-use yet powerful DVD burning program to burn all popular video formats like MP4, WMV, AVI, MKV, FLV, MOV, M4V, etc. to DVD in Windows 10/8/XP/7/Vista for playing on any standard home DVD player or TV. 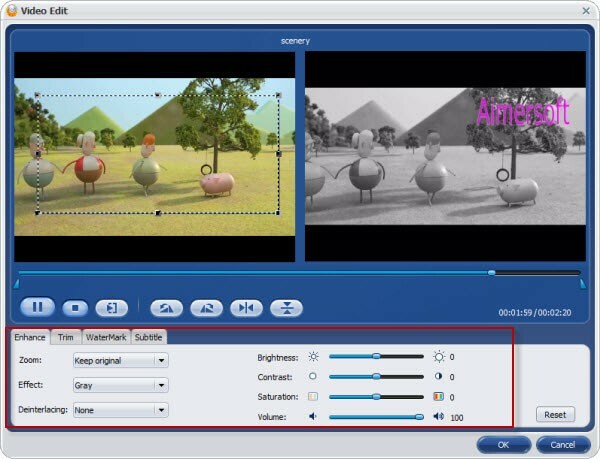 In addition, it comes with a built-in video editor that allows you to personalize your videos by cropping, trimming, adding watermarks, adjusting video effects, etc. What's more, lots of free DVD menu templates are provided to make your DVD more professional. This DVD Creator can fully support Windows 8/7/Vista. After downloading, install and run the program, then click Import to add the MP4 videos. As you can see, loaded videos can be previewed on the right preview window and you can take snapshots of your favorite movie scenes. When adding videos, pay attention to the green bar at the bottom to ensure that your media size doesn't exceed your DVD capacity. Select a video clip and click Edit to open the Video Edit window, where you can trim, crop, rotate, add watermarks, adjust video effects, etc. and even add subtitles to your DVD movies. Next, go to Menu tab to select a DVD menu you like and then personalize it with your favorite images, buttons, frames, etc. When all settings are OK, click Preview to see how your DVD looks like and finally go to Burn, follow the instructions to insert a writable DVD disc and start burning your MP4 to DVD in Windows 7 or Vista without any troubles. Codecs are required to efficiently decode and encode audio and video files. Encoding and decoding are two essential tasks performed by video software in order to correctly play or burn video files. People who find it impossible to burn MP4 files into a DVD via the Windows DVD Maker can easily solve the problem by installing the necessary codecs from the K-Lite Codec Pack. K-Lite Codec Pack, which includes the MP4 codec for Windows DVD Maker, offers the most complete collection of codecs that will allow you to do all you ever wanted with your movies. This codec pack is what most users prefer as it is always updated, user-friendly, easy-to-install, and fully customizable. All codecs included in the package are guaranteed work well without any conflicts. More info about Windows DVD Maker MP4 codec: K-Lite Codec Pack comes in three versions: Full, Standard, and Basic. The Basic pack is for the certified movie fan. The package contains all the necessary codecs to be able to play the most common video file formats. The Standard Pack is for the movie editor. The codec collection under this set includes codes even for the not-so common video file formats. It is the codec that allows users to play movies on almost any media player software and burn movies using the Windows DVD Maker. The Full K-Lite Coded Pack is for the professionals. People who wish to do their own decodings and encodings are going to need this package. The full version includes the Media Player Classic Home Cinema, DirectShow Video and Audio decoding filters, parsers, source filters, and subtitle filter. Other filters, tools and shell extensions are included in the K-Lite full version as well. Burn Utorrent to DVD: If you'd like to burn Utorrent videos to DVD, you can follow the tutorial to accomplish the task. Burn Isohunt to DVD: This tutorial describes the steps for downloading torrents from Isohunt and burning the movies to DVDs.